According to a new report presented to the governor of New Jersey, increasing immigration enforcement is one of the most successful strategies for breaking up cliques of the notorious MS-13 gang. The State Commission of Investigation (SCI) is New Jersey's independent criminal-justice watchdog agency. The SCI launched a new publication series titled the "Organized Crime Spotlight". Given the gang's large presence in the state, it is fitting that MS-13 was the SCI's first subject. Many of the findings shed new light on the gang's activities and culture in both New Jersey and throughout the entire country. One of the key findings is that gang leaders in El Salvador successfully gained control over U.S.-based cliques and centralized the gang's activities. Previous reports on MS-13 remarked that the gang was largely decentralized and that the cliques operated separately and independently of each other. This new report argues that the opposite has occurred: All of the cliques defer to higher-ups in El Salvador and "cooperation among cliques has flowered within the United States." 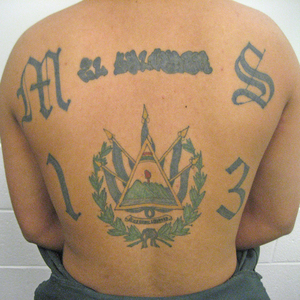 The current structure of MS-13 starts at the top in El Salvador. Those leaders then group the individual cliques into regional "programs". Each program has any number of cliques. As the number of MS-13 cliques grew, so did the number of regions in which they were present. An indictment from Nassau County, N.Y., discloses that MS-13 bosses in El Salvador communicated regularly with members in Mexico, Colombia, South Korea, France, Australia, Peru, Egypt, Ecuador, and Cuba. With members numbering in the thousands across multiple countries, it is no wonder that the Justice Department named MS-13 as a transnational criminal organization. MS-13 differs from traditional American street gangs (Bloods, Crips, etc.) in some important ways. One is that there are not multiple generations of MS-13 members within one family. The report notes that "members have been known to pull back from MS-13 activity once they start their own families." It could also be that because the age of gang members is typically very low, many end up either dead or incarcerated before they have a chance to raise children who would eventually join the gang. A CIS study on MS-13 found that the median age of members at the time of their arrest was 23, and that MS-13 has members as young as 14. Many traditional gangs are made up of "full-time" gang members. That is, their primary and only source of income comes from gang-related activities such as dealing drugs or committing robberies. This report found that MS-13 is different. Most of their New Jersey members hold jobs in regular sectors of the economy, including in the construction, landscaping, and restaurant industries. This is because "the MS-13 ethos is less the pursuit of riches than it is the pursuit of protection, respect and reputation." This report notably uncovered a strategy used by gang members when they come into contact with law enforcement. New Jersey police officers notice a pattern after they arrest a suspected gang member. That member tells them a story of escaping from the gang in El Salvador (or wherever home is) and arriving in the United States only to be harassed by the gang again. They often claim that the gang victimizes them and they have no choice but to cooperate with MS-13. The report states that arrested MS-13 suspects tell law enforcement officials versions of this same story after their arrest. Despite the sympathetic tale, it is often discovered through investigation that they are in fact full-fledged members. Immigration enforcement is one of the most effective tools at combating the spread of MS-13 in the United States. In New Jersey, officials realized that "it is equally clear that cooperation with federal immigration authorities has been successful in heading off potential violence by removing from our communities undocumented gang members with criminal histories." They acknowledge their partnership with Immigration and Customs Enforcement (ICE) as a reason for New Jersey's drop in MS-13 activity over the past three years. [M]embers of MS-13 in their native countries cross illegally into the United States, establishing ties with cliques here. ... [I]mmigrant communities, fearful of cooperation with police, continue to be quietly victimized. MS-13 does not target businesses outside Central American communities because the likelihood of such activity would attract police attention. ... MS-13 members have been known to learn the names and addresses of business owners' relatives in their native countries and to use that information to extract cooperation in New Jersey. ... In some communities, MS-13 also targets immigrant day laborers, charging them a fee in exchange for permission to seek work at locations where laborers gather. This only further confirms what many immigration experts already know: Sanctuary policies are dangerous for immigrant communities. When a sanctuary city releases a criminal alien (instead of safely transferring him to ICE custody) he returns to the immigrant community. Rather than removing an MS-13 gang member from the country, sanctuary laws ensure that he will return to his neighborhood and continue extorting businesses, dealing drugs, and threatening residents. Increasing the number of arrests and deportations of alien criminals would do more to help immigrant neighborhoods than any sanctuary law ever could. Four counties in New Jersey have sanctuary laws. It is unsurprising that these counties, such as Union, have large gang populations. This report shows that immigration enforcement had a direct, negative effect on MS-13's presence in New Jersey. With that in mind, authorities must use immigration enforcement widely and unapologetically as a tool in the fight against transnational criminal organizations.